Our History – Botts Construction, Inc.
For generations the Botts name has been synonymous with quality building construction. In 1972, while an active real estate professional, Jerry A. Botts saw a need for quality built housing and an opportunity to continue a family tradition. Jerry inherited a professional manner and appreciation for quality workmanship from his father. He also knew that to be successful in life and business people should treat others fairly. 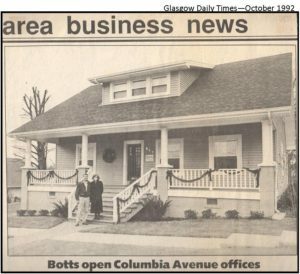 Together with his father, Norris Botts, Jerry began building homes throughout the Glasgow area. Jerry focused on taking care of the clients, Norris managed the crew and wife, Debbie, kept the books. As teenagers, his sons, Joey and Spencer, began learning the family business as they spent summers working with the crew framing and roofing homes. Jerry & Debbie went on to incorporate the business in 1994 and serve as President and Vice-President. Joey & Spencer both left Glasgow to attend the University of Kentucky. After earning a degree in Civil Engineering, Joey returned to the company in a supervisory position in 1993. Spencer soon returned from college and joined his brother in the family business. In 2009, Joey & Spencer succeeded their parents as President and Vice-President as well as owners of the company. Today, they operate the company based on the founding beliefs that their success depends on treating people fairly and delivering a quality product. The proof of this success is in the lifelong relationships that have been forged with suppliers, subcontractors, employees and of course, their clients.